"Green bean casserole unlike any other!" Preheat oven to 350 degrees F (175 degrees C). Grease a 1 1/2 quart casserole dish. Melt 1/4 cup of butter in a large skillet. Stir flour into the butter to make a paste. Blend sour cream into the flour paste, stirring constantly. When the mixture is hot and bubbly, remove from heat, and stir in Swiss cheese. When the cheese has melted, add the green beans, stirring until they are coated. Pour the entire mixture into the prepared casserole dish. 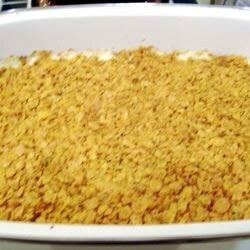 In a small bowl, mix together the cornflakes and melted butter. Sprinkle over the top of the green beans. Bake uncovered for 30 minutes in the preheated oven, or until bubbly and golden brown. See how to make creamy, delicious green bean casserole with a crunchy top. These were the best grren beans I ever ate. My husband even liked them and he doesn't eat green beans. We have made it several times for guest and it is always a hit, Thanks Tim!! Interesting twist on a holiday standard. I'd opt for a little less sour cream though, as it was almost too tangy. It was wonderful!! I don't like plain green beans. This makes the beans taste wonderful. I used the French Onions on the top.